""I wanted to stay in Boston and I just enjoy everything about being a Bruin and the city, the organization and coming to the rink here, it's always a good feeling. It's an honor to play for such an organization like this with so much history and is going in the direction we're going." The defending Northeast Division champion Boston Bruins have been picked by many pundits as the team to beat again in the division and the Eastern Conference. There aren't too many question marks surrounding the Bruins, but after watching one of their young stars, Phil Kessel, depart via trade Sept. 1, there were questions as to whether General Manager Peter Chiarelli can keep the young core of his team together for the foreseeable future. The answer appears to be yes. Chiarelli was able to re-sign restricted free agents David Krejci and Matt Hunwick over the summer, and Tuesday he locked up restricted free agent-to-be Milan Lucic to a three-year extension. Lucic has become a cult hero in Boston, compared to the likes of Cam Neely and Terry O’Reilly for his grit, size and scoring potential. The 21-year old, who hails from Vancouver, the same city that Neely grew up near and started his NHL career in, has embraced the fans' love and claimed it was an easy decision to forego restricted free agency next summer and the chance at an even bigger pay day for the three-year, $12.25 million deal he just signed. 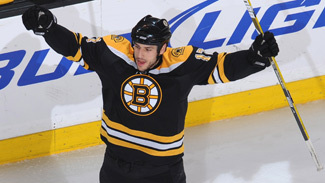 "I didn’t want to get into that situation," Lucic said of restricted free agency. "I just felt it was a good move to get that done before becoming an RFA. I wanted to stay in Boston and I just enjoy everything about being a Bruin and the city, the organization and coming to the rink here, it's always a good feeling. It's an honor to play for such an organization like this with so much history and is going in the direction we're going." Milan Lucic is a throwback to the days when the Bruins were one of the toughest teams in the League. Today, Lucic typifies that style of play. Lucic actually told Chiarelli in a season-ending meeting last May that he wanted to start working on an extension, and Chiarelli couldn't have been more thrilled to oblige. "At the exit meeting this past year, Milan expressed to me that he loved being a Bruin and wanted to be a Bruin for a long time," Chiarelli said. "So obviously that was something that made it a lot easier and good to hear. I was really excited to get this done. I love the way Milan plays, I love the way he carries himself on and off the ice. He's a very humble person and he deserves this." According to Chiarelli, getting the deal done now was key to the team's future, but he admitted he still faces more challenges, as he will look to re-sign soon-to-be restricted free agents Blake Wheeler, Mark Stuart and Tuukka Rask, as well as Marc Savard, who can become an unrestricted free agent this summer. "It's a difficult task and even before those guys (restricted free agents), you're talking about guys that are here and in the final year of their contracts," Chiarelli said of balancing the task of signing unrestricted and restricted free agents. "There's a lot of uncertain things that you're waiting to see happen so you can plan better and we obviously went through the same thing to a certain degree with Phil on this, and it won't be easy, but I'll do my best and this certainly a piece of the puzzle." Grinders get goals -- Besides getting scoring and toughness from newly signed Milan Lucic on their top line, the Bruins have been getting a similar combo from their fourth line of Shawn Thornton, Steve Begin and Byron Bitz. Not known for their scoring prowess, the grinding trio combined for 4 points in the team's first two games, with Begin chipping in 3 assists and Thornton lighting the red lamp once. None of them are thinking Art Ross Trophy, but they're happy to help the team in any way possible. "I don't think so," forward Steve Begin laughed recently when asked if the scoring streak could continue all season. "It's nice when you can help out that way, but we know our jobs out there and we're just going to work hard and keep it simple." Coach Claude Julien, who also coached Begin in Montreal, is happy with Begin's performance and looks at the points as frosting on the cake. "He's up there, I think, with 3 assists in two games and I don't think we should expect him to lead us in scoring, but, definitely what he's done in the last couple of games is usually what you get out of him," Julien said. Quandry for Sabres -- As Bucky Gleason of the Buffalo News recently reported, the Sabres may face some salary cap and roster issues soon when forward Adam Mair returns from off-season hip surgery. Gleason listed players like forwards Tim Kennedy, Matt Ellis, Daniel Paille and Clarke MacArthur, as well as defensemen Nathan Paetsch, Toni Lydman and Henrik Tallinder as possible candidates to be traded or sent to AHL Portland. GM Darcy Regier seemed confident he can sort the situation out without affecting the team's success. "We've had situations like this in the past," Regier told the Buffalo News. "They have a way of sorting themselves out. Right now, we don't have a decision. If everyone stays healthy, we will have a decision. We know the scenarios and the possibilities. I think we'll be OK."
Soldering on without Markov -- It would have been completely understandable if the Canadiens entered their fourth game of the season Wednesday in Vancouver winless. But despite losing their best defenseman, and arguably their best player, in Andrei Markov to a severed ankle tendon on opening night, and then defenseman Ryan O'Byrne to a knee injury the next game, the Habs entered Wednesday's game against Vancouver with a 2-1-0 record. One of the main reasons for their early success has been goaltender Carey Price, who entered that game 2-0-0 with a 2.89 goals-against average and .951 save percentage, and appears to be focused and ready to bounce back from a forgettable season. Price was rocked for seven goals on 32 shots in a 7-1 loss to the Canucks, but that hasn't changed how his teammates feel about him. "Last season there were a lot of downs for the whole team and everyone pointed fingers at him," defenseman Josh Gorges told the Toronto Globe and Mail. "It's not easy being a goalie for the Montreal Canadiens. But when he came to camp this year you could tell he was in great shape and ready to go. I think it's just maturity. It took me three, four years before I understood the little things you have to do and he’s only 22." The Habs recalled Yannick Weber on Sunday and signed unrestricted free agent defenseman Marc-Andre Bergeron Tuesday to add depth to their depleted blue line. Leclaire moving on -- The Senators have high hopes for new starting goaltender Pascal Leclaire, and Tuesday the goalie got his first win in a Senators uniform and first anywhere since Nov. 14, 2008. Leclaire, acquired from Columbus in March, is coming back from an ankle injury that ended his season last December, was happy to get the first win out of the way. "The first one is one I've been looking forward to for a long time," Leclaire told the Ottawa Sun. "You don't feel part of a team until you have a win when you're a goalie. It's been a while and it's a pretty fun night for me." New Senators forward Alexei Kovalev is a very skilled hockey player and this season he is hoping to bring his creativity to the fans via a blog for RDS.ca. "I'm not a journalist or whatever," Kovalev told ESPN.com. "I just said, 'We'll try it and see how it goes.'" Wilson lets Leafs hear it -- When Ron Wilson took over as coach of the Maple Leafs, it didn't take long for people to learn there was a new sheriff in town and that players would be held accountable. Following the team's recent 2-1 loss to Ottawa, Wilson reminded anyone that may have forgotten that. "We stunk; we had no offense at all," Wilson told the Toronto Sun. "I mean, that was almost embarrassing from seven or eight guys who we are counting heavily on. They only showed up when it was too late (a third-period Matt Stajan power-play goal). Playing on the perimeter, not wanting the puck, not willing to take a hit to make a play. Jittery when we do have the puck. We need a much better effort." Wilson also has let goaltenders Vesa Toskala and Jonas Gustavsson know the top spot between the pipes is up for grabs. After two disappointing starts, Toskala was riding the pine for the Ottawa game and Gustavsson played well in defeat, making 26 saves. Buffalo -- Adam Mair is on injured reserve after offseason hip surgery but could be back for Saturday's game in Nashville. Defensemen Andrej Sekera (facial laceration) and Toni Lydman (hand) are day-to-day. Montreal -- Defenseman Andrei Markov is on injured reserve after severing his left ankle tendon in the season opener and is expected to miss up to four months. Fellow blueliner Ryan O'Byrne was injured in the second game and is on injured reserve and out indefinitely with a knee injury. Forward Glen Metropolit (ribs) is day-to-day. Ottawa -- Forward Jesse Winchester is on injured reserve with a knee injury. Forward Ryan Shannon is day-to-day with a concussion. Toronto -- The Maple Leafs will be without forward Phil Kessel until at least mid-November following off-season shoulder surgery. Defenseman Mike Van Ryn is on injured reserve with a knee injury and forward Viktor Stalberg is day-to-day with a concussion.